The peninsula on which the town of Paleochora now stands used to lay under water when a major earthquake made the west side of Crete rise up making the peninsula of Paleochora emerge from the depths. In ancient times there was a city called Kalamyde a short distance north of where the town is now situated. Although little is known about Kalamyde, it was probably the seaport of ancient Kandanos and flourished in the Doric and Roman times along with the neighbouring cities of Syia (Sougia), Lissos, Poikilassos and Tara (Agia Roumeli). In 1278, the Venetian general Marino Gradenigo built a fort in the Palechora area, called the “Selino Kasteli”. The fort gave its name to the whole province, previously called “Orina”, which was then renamed “Selino”. The fort was destroyed in 1332 and it was rebuilt in 1334. Near the fort, the Venetians established a new settlement for workers and merchants called Vourgos. The pirate Hayreddin Barbarossa destroyed the fort in 1539, but later in 1595 Dolf revamped it. In 1645, the Turks conquered the town and modified the fort to suit their needs. In 1834 an English traveler named Robert Pashley found the fort completely destroyed and the whole area without any inhabitants and with only a granary and one or two small buildings left. In 1866 the recolonization of Paleochora began. In December 1866, during the Cretan uprising against the Ottoman Turks, the British gunboat HMS Assurance evacuated some 340 women and children from Paleochora, then known as Selino Castelli/Kastelli, and took them to Piraeus for safety. This caused a major international incident since the Ottomanauthorities accused the British of siding with the Cretan rebels. Russian gunboats followed suit, evacuating refugees from Loutro and Sougia, east of Paleochora. During the Battle of Crete during World War II, the town was the scene of fighting between motorcycle-riding troops of the German 95th Reconnaissance Battalion and the Eighth Greek Regiment (Provisional) with elements of the Cretan Gendarmerie. The Germans built a number of gun emplacements by the Venetian Fortezza and their remains are still present. The general phase of urbanization that started in other parts of Greece in the 1960s, took place in the 1950s on the nearby island of Gavdos. During that period the islanders exchanged their land on Gavdos for ex-Turkish land on Crete, which had now become exchangeable through a state program. 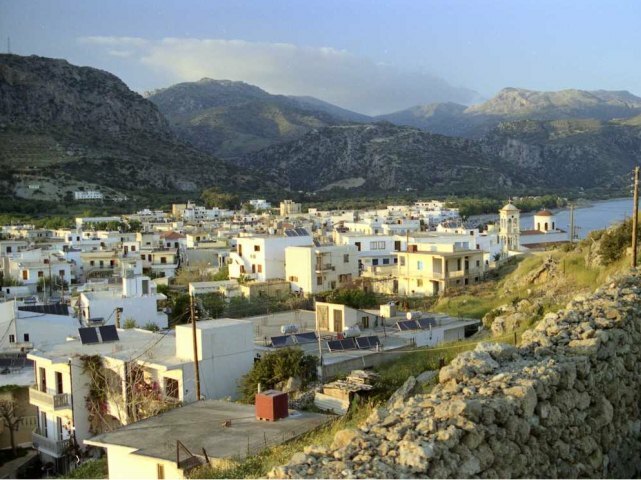 They created a community known as “Gavdiotika”, in the ‘old town’ section of Paleochora.